An efficient farming operation depends on managing dairy effluent in a way that it’s nutrient properties are utilised, without damaging the environment. There are a multitude of methods available to store and treat dairy effluent, and it is important you obtain good advice in this area. 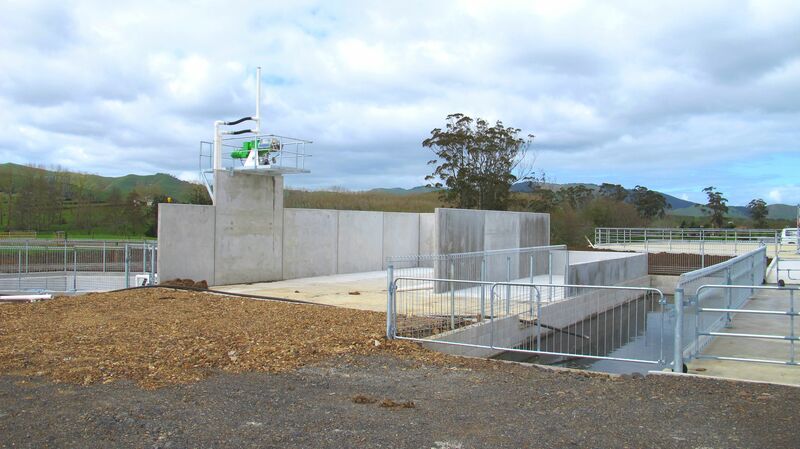 Chapman Dairy™ has deep experience in the management of farm dairy effluent systems. We can either just construct the necessary concrete structures and drying areas, or we can manage the entire effluent separation stage. The choice is yours. Shed and yard water flow into a bunker with a weeping wall, which holds back up to 80% of the solids. The Chapman DairyTM weeping wall design is a well-engineered solution for extremely efficient and economical management of solids. The wall and containment area is divided into two sides. Only one of the two sides is used at a time, allowing solids in the other side to dry. Dry solids can then be safely spread onto the land as zero-cost fertiliser. Farmers often find that precast sand traps are too small for the job at hand, typically requiring emptying several times per week. This is time consuming and is often not done, allowing solids to pass through the effluent trap when it’s full. Because Chapman DairyTM sand wedges and traps are custom designed to a size that meets your needs exactly, they may only need emptying monthly or even less frequently. If you want to get the most from your dairy effluent, take advantage of our vast experience and contact Chapman Dairy™.